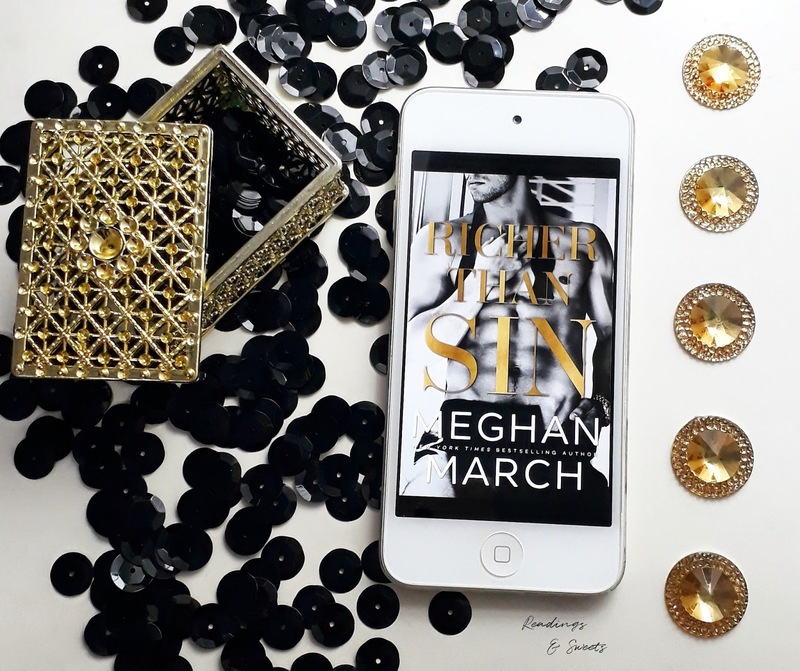 Today is the release day of 'Richer Than Sin' by Meghan March! Now, ten years later, Whitney is back and this time, Lincoln will not let her go so easily. When young Whitney Gable and Lincoln Riscoff were attracted to each other, but Gables and Riscoffs were in a legendary war since forever. Whitney and Lincoln tried, but their forbidden romance ended in the worst possible way: broken hearts, Whitney marrying another man and Lincoln objecting the ceremony. Now, ten years later, Whitney is back to the home she once knew and, even more broken than she was before. Life wasn't so easy on her and what should be her escape, turned out being her hell. When Lincoln got the word about her being back, he promised to himself that this time he woulnd't let Whitney escape again... But the feud between the Gables and Riscoffs is still strong. Whitney just wanted a safe place, where no one would recognise her, where her fame os 'black widow' wouldn't hunt her, just like the paparazzi and her late husband's fans. But of course it would be ask too much to have some peace in the town where the Riscoffs owned everything. She knew she would have to deal with a lot of things when she decided to come back, but expected to avoid Lincoln until the time to leave again. But the odds weren't in her favor because since the moment she sets a foot in the town, he's one of the firsts she meets... And after that, Lincoln seems to be in every place Whitney goes. But the destiny has a lot of card in its sleeves and soon Whitney remembers the reason she left... The question that stands is: will the past, even after all this time, repeat itself? This thing between Lincoln and Whitney reminded me a little bit of 'Romeo and Juliet', but without the death part, of course! Forbidden love, family feud... Whitney and Lincoln are strong and independet characters, but that unfortunately ended up being only pieces to their family chess game. Whitney has been through a lot after her first time with Lincoln and after in the final days of her marriage and the death of her husband. She has a heavy baggage and tries to keep strong, even when her strength is nowhere to be found... And the fact that Lincoln seems not fine with leaving her alone, it's not a good thing to her already fragile peace of mind. Lincoln is a character that it took me a while to like and I still don't know if I really liked him... During the book, the author goes back and forth with the past, so we can have a better view about what happened ten years ago between Lincoln and Whitney, and well, I can tell you that Lincoln was a douche (still is, actually). Although he tries to fix the things in the present and guarantee to keep Whitney in his life, I still don't trust him... I can feel that's more coming down the hill. Grab you 'Richer Than Sin' copy today!